Adak Island (Aleut: Adaax) is an island near the western extent of the Andreanof Islands group of the Aleutian Islands in Alaska. Alaska's southernmost town, Adak, is located on the island. The island has a land area of 274.59 square miles (711.18 km2), measuring 33.9 miles (54.5 km) on length and 22 miles (35 km) on width, making it the 25th largest island in the United States. Due to harsh winds, frequent cloud cover, and cold temperatures, vegetation is mostly tundra (grasses, mosses, berries, low-lying flowering plants) at lower elevations. The highest point is Mt. Moffett, near the northwest end of the island, at an elevation of 3,924 feet (1,196 m). It is snow covered the greater part of the year. Adak, Alaska, is its largest and principal city. The word Adak is from the Aleut word adaq, which means "father". Adak Island has been the home to Aleut peoples since ancient times. Russian explorers in the 18th century also visited the island but made no permanent settlements. During World War II, the Imperial Japanese Army took control of two of the westernmost Aleutian Islands - Attu and Kiska. The Japanese also attacked the American base at Dutch Harbor by air. The Japanese campaign coincided with the more well-known Battle of Midway. In response, the United States military began a campaign to oust the invaders. Since the nearest U.S. military presence was in Cold Bay, Alaska, the U.S. began to construct bases in the western Aleutian Islands from which to launch operations against the Japanese. Adak Island was chosen as the site of an airfield, and flight operations began in September 1942. On May 11, 1943, four days after the initial invasion date was delayed by bad weather, American soldiers landed on Attu Island and defeated the Japanese garrison there, at the cost of 2,300 Japanese and 550 American lives. Expecting a similar battle for Kiska Island, U.S. soldiers landing there August 15, 1943, found the occupiers had been stealthily evacuated by Japanese naval forces since the end of May, 1943. Even so, over 313 American soldiers died from friendly fire, mines, and other anti-personnel devices during U.S. operations to recover Kiska into U.S. territory. In 1953, remains of 236 Japanese dead who had been buried in Adak Cemetery were reburied in Japan's Chidorigafuchi National Cemetery. After the war was over, the approximately 6,000 American military men who served on Adak during World War II recalled Adak's cold, foggy, windy weather; mud; Quonset huts; few women and no trees; and a volcano that from time to time would issue puffs of smoke. Fresh food was a rarity. Adak Naval Air Station continued to be a military base during the Cold War but was designated a Base Realignment and Closure (BRAC) site in 1995 and closed in March 1997. Shortly thereafter, the town of Adak was incorporated at the site of the former base. Down from a peak population of 6,000, the island recorded a 2010 census population of 326 residents, all in the city of Adak, in the northern part of the island. 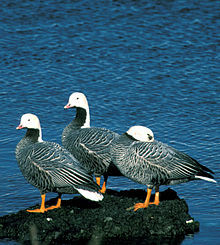 In 1980, the Aleutian Islands National Wildlife Refuge was created and much of Adak Island lies within its boundaries. The Alaska Department of Fish and Game introduced approximately 200 caribou to the island to help prevent emergency famine. The now large caribou herd is a popular hunting destination. Adak has a subpolar oceanic climate (Koppen Cfc), characterized by persistently overcast skies, moderated temperatures, high winds, and frequent cyclonic storms. At Adak, overcast conditions average nearly 75% of the time during June and July, dropping back to approximately 50% of the time from October through February. Adak averages 173 days per year with fog. The foggiest months are July and August when an average of 26 of the 31 days have fog. This number drops dramatically toward the winter season where the months of December through March have, on average, fewer than ten days with fog during any one month. Gales occur in all months of the year at Adak with the greatest chance from December through March. A peak gust of 109 knots occurred at Adak in March 1954. Adak's average temperatures range from 20 to 60 degrees Fahrenheit, with a record high of 75 °F (August 1956) and a record low of 3 °F (January 1963 and February 1964). Average annual precipitation is about 54.8 inches. October to January are the wettest months due to especially frequent and intense mid-latitude cyclonic storms, while May to July represent markedly drier months; thunderstorms, common in mid-latitude continental areas, are virtually unknown here. November is the average wettest month, while July is the average driest month. Average snowfall is 100 inches, falling primarily on the upper reaches of the volcanoes. Adak has an average of 341 days per year with measurable precipitation. Adak is served by the Aleutian Region Schools. The Adak School serves grades K-12 and has around 20 students. A land exchange between Aleut Corp., the U.S. Navy, and the Department of the Interior has transferred most of the naval facilities to the Aleut Corp. A portion of the Island will remain within the National Maritime National Wildlife Refuge, managed by U.S. Fish & Wildlife. Adak currently provides a fueling port and crew transfer facility for foreign fishing fleets—an airport, docks, housing facilities and food services are available. A grocery and ship supply store and restaurant opened in February 1999. Aleut Corporation maintains the facilities. Contractors are performing an environmental clean-up. Alaskan-owned Norquest-Adak Seafood Co. processes Pacific cod, pollock, mackerel, halibut, albacore and brown king crab. Four residents hold a commercial fishing permit, primarily for groundfish. The January 2006 National Geographic magazine presented pictures of the Sea-based X-band Radar in tow around Cape Horn to Adak for the purpose of anti-ballistic missile space surveillance. This operation required about one hundred technicians. Google Earth pictures the long-time Naval Air Base infrastructure to be located at 51°52′37.07″N 176°38′55.00″W﻿ / ﻿51.8769639°N 176.6486111°W﻿ / 51.8769639; -176.6486111. Because of its naval aviation past, Adak has an unusually large and sophisticated airport for the Aleutian Islands. The Adak Airport is currently operated by the State of Alaska Department of Transportation. Adak Airport has a control tower, an Instrument Landing System and two runways; 7,790 ft (2,370 m) and 7,605 ft (2,318 m) respectively. Both runways are asphalt paved, 200 ft (61 m) wide and at an elevation of 19 ft (6 m). Alaska Airlines operates twice weekly 737-400 Combi passenger and cargo jet service from Anchorage. At present, flights operate each Sunday and Thursday (weather permitting). Occasionally, extra seasonal flights are operated to meet the demand of the fishing season. There are approximately 16 miles (26 km) of paved and primitive roads on Adak, all privately owned by the Aleut Corporation. The Aleutian shield fern is an endangered species found only on this island. Adagdak and Mount Moffett volcanoes are located on Adak. The igneous rock type adakite is named after Adak. ^ "PUBLIC HEALTH ASSESSMENT NAVAL AIR FACILITY, ADAK (a/k/a ADAK NAVAL AIR STATION) ADAK, ALEUTIAN ISLANDS CENSUS, ALASKA". atsdr.cdc.gov. Retrieved 27 December 2014. ^ Traveler T. Terpening, Alaska, Bradt Travel Guides, 2010, ISBN 1-84162-298-2, page 393. ^ "Adak Island, Alaska Travel Weather Averages". Weatherbase. Retrieved 2017-12-16. 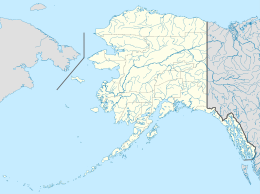 ^ "Alaska Community Database". Archived from the original on 2009-10-06. Retrieved 2010-05-13. ^ "NPWRC :: Endangered and Threatened Species Recovery Program". npwrc.usgs.gov. Archived from the original on 2009-05-14. Retrieved 2009-11-20. Wikimedia Commons has media related to Adak Island. "Marine Barracks Adak". Archived from the original on 2009-10-25. Retrieved 2007-06-29. Photographs of Adak 1944 onward, mostly by U.S. servicemen.